LSU Tiger Fans- Go to the game with this Purple and Gold Pinwheel bow! This has heaping layers of satin ribbons mixed with yellow gold and purple ribbons. The base bow is a white 2.25" grosgrain bow that is covered with four loopers on each tail. The loopers are a 3/8" grosgrain ribbon with colorful polka dots. In the pinwheel there are different colors of purples that have polka dots and peace signs. 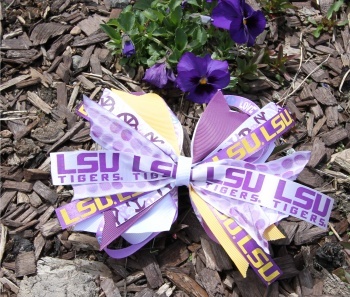 This is a bow any Tiger Fan will be proud to wear to the big game.